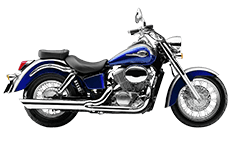 As part of the Shadow Ace series of motorcycles, Honda's 750 model is a great middle-of-the-road bike for riders who want a little more power. We've introduced this collection of Viking saddlebags for specific use with this lineup of bikes, helping riders carry their luggage with a brilliantly designed saddlebag. No matter what kind of style rider you are, you'll find some attractive pairs of luggage bags here in our online store.